The message has been clear from countless sources: parents need to read to their children. But what parents really need to know is how they read makes all the difference in the development of their children’s vocabulary, comprehension and critical thinking skills. Research has shown that by reading with their children – not to them – parents greatly increase children’s language and literacy, developing the foundation they need to enter kindergarten as strong, confident learners on a path to grade level reading and so much more – for a lifetime. Plus, story time will be more fun as parents help their children become storytellers themselves. To help parents learn key things to do at story time, the Rollins Center for Language & Learning at the Atlanta Speech School has partnered with the Junior League of Atlanta to produce the complimentary video READ. 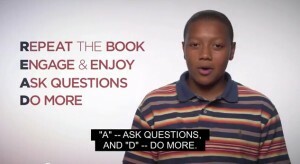 In just five minutes, parents learn what they can do to make books come alive for their children and increase their learning: Repeat Books, Engage and Enjoy, Ask Questions, and Do More. A two-page coaching sheet recaps the four steps, and provides more information on the research that is the basis for the READ strategy. This video is narrated by Justin Cook, a 2010 graduate of the Atlanta Speech School’s Wardlaw School, and is posted on the school’s website, atlantaspeechschool.org. Founded 75 years ago by Katherine Hamm in partnership with the Junior League of Atlanta, the Atlanta Speech School is one of the world’s most comprehensive centers for language and literacy. Through the work of its four schools and five clinics, the School impacts the lives of 1,400 children and adults at the Atlanta Speech School and thousands more children beyond our campus through our Rollins Center for Language & Learning professional development program. The Rollins Center thanks Peachtree Publishers for the use of The Scarecrow’s Hat by Ken Brown.